Five Business Gift Giving Mistakes To Avoid This Holiday Season! Above: Tina was a contributor to the top selling book 'Top Dog Sales Secrets' as one of the Top Experts! To The Left: Tina LoSasso, Managing Editor at SalesDog.com, and also President of her own company at MakeItSoMarketing.com! That has been taking a toll on my 'free time' in blogging and contributing to the social media and comics forums that I am associated with. I haven't been able to read and reply fully to the emails and messages that have come in to me. However, a message sent last night to me made me want to stop and re-publish a series of blog posts that my wife Tina LoSasso had guest blogged two seasons ago. Those blog posts are no longer visible, because they were in the eBay version of our Blog, which has been discontinued by eBay itself. So when this eBayer friend of mine asked if I could re-post the blogs here I said yes. So the following are all Five of the Tips that Tina posted two seasons ago. I thought it would be timely as well as informative, because on my Facebook Network of Friends alone, there are many self-publishers that are probably wondering what to give to their business network of associates this year. Plus there are a lot of creators that are holding down day jobs until their own creations are published! 1) Quality trumps quantity. "A small box of exquisite, handmade truffles will be appreciated far more than a big box of run-of-the-mill chocolates," LoSasso advises. "If the head honcho at your biggest account is a wine connoisseur, remember, it's far better to send one bottle of the very best than several ordinary bottles he'll never uncork." 2) Reject run-of-the-mill. Shun the ho hum food baskets and opt for a more memorable gift. "Check your client notes," suggests LoSasso. "What are his hobbies? Does he golf, cook or play sports? If your client, the gourmet cook, is still raving about the meals he enjoyed during his vacation in Tuscany, send him a beautifully illustrated regional cookbook. Your gift, and you, will be remembered far longer than a generic tin of cookies." 3) Don't even think of advertising. "Sending gifts with your company's logo on them make you look stingier than Scrooge," says LoSasso. "Save the logo-imprinted pens, paperweights, mouse pads and calculators for your next trade show. Instead, send a gift from your region of the country: Ghirardelli chocolate from San Francisco, smoked salmon from the Northwest, citrus from Florida or California, or barbecue sauce from Texas." 4) Beware of booze. 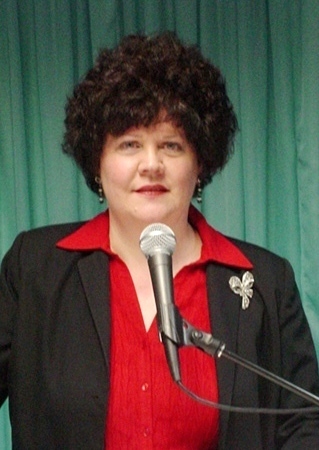 "Alcoholic beverages are usually risky business," warns LoSasso. "The one exception is when you know someone loves a certain brand of rare Scotch, a particular wine, or a regional microbrew. Never send a bottle of champagne to that key account in Salt Lake City, or for that matter, frozen steaks to your customer who is a vegetarian. Don't laugh -- it happens." 5) The gender trap. Gender differences present their own gift-giving dangers. While it is generally acceptable for a saleswoman to send her stressed-out women clients personal items, like lotions or a spa kit, salesmen should not be so familiar. "Sorry guys," says LoSasso. "You're not in the club." 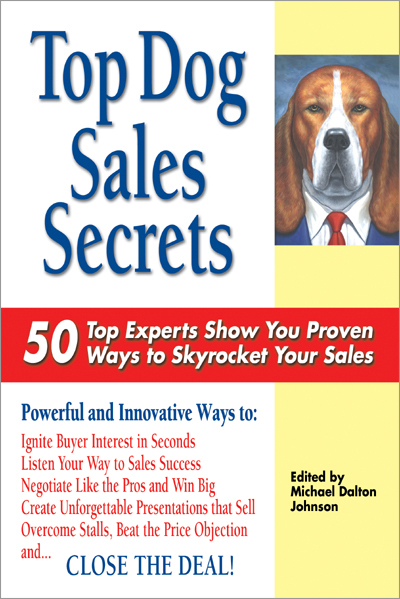 LoSasso's advice is excerpted from the bestselling book, Top Dog Sales Secrets, authored by 50 renowned sales lecturers, consultants, and corporate trainers. 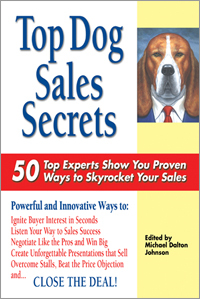 Top Dog Sales Secrets is available from the publisher or from Amazon and other online retailers. That ends the 5 Tips and the introductory info about Tina's contributions at SalesDog.com. BTW, SalesDog.com features advice from America's leading sales experts. Their free weekly newsletter has over 25,000 subscribers. You are invited to sign up there for that newsletter if advice on Sales can help you bring 2009 to a satisfying close! My thanks to Tina for allowing me to re-publish those earlier five blog posts into one Blog here today! AND... Thanks again to all of YOU reading our current and archived blog posts! We do blog usually on a daily basis on comic book creators, comic book reviews, comic cons, and other pop culture news and events including some TV shows and theatrical films as they are shown. This current week since 'Black Friday' to 'Cyber Monday' to this morning has been kind of overwhelming, but I am Thankful (Thanksgiving Day wise) to be busy! PLUS... Welcome to ALL of You that were reading the eBay Version of our Blog prior to eBay closing 'their eBay blogs platform' on October 31st, 2009. That version of our Blog had 1.37 MILLION page views before the closure... However, This Blog version is the same Blog that has been published at the same time the eBay version was being published. I've been publishing this version since September 2007, so it has the same 'Fun Stuff' you are used to reading on the eBay version! Speaking of eBay... Be sure to check out our own new listings of comics, graphic novels, Comic Con exclusives and more pop culture items for sale in Our online eBay Featured Store that our blogs are based on! It's due to sales at this online store that keep us going with the ability to post blogs like the one you have read here today! For You Since May 12th, 1998!" Note: If you breaking into or already work in the comic book industry or other pop culture productions, you are welcome to email us press releases, news items, and updates that you feel would be of interest to our blog readers. Including YOUR own works! If you are a Facebook member and want to join my Facebook Network, feel free to send a 'friend request' to 'Michael D Hamersky'. RECOMMENDED GRAPHIC NOVELS AS GIFTS FEATURETTE: This blog's 'Main Feature' today was on what items to avoid giving as a holiday present to business associates. Well, what about those business associates that you work with on a regular basis and personally know very well, and that you would like to introduce them to the reading genres that you enjoy? I would think that giving a graphic novel could be a good idea if you have heard them talk about books and / or movies that they have recently read or seen. Here are some thoughts on graphic novels that I have reviewed this year with what audience to give as gift to. The above are just some of the ideas that I have, based upon my personally reading them and then reviewing them here. Again, the above are meant for business associates or business friends that YOU personally know, and are NOT currently reading graphic novels. It would be a lot easier for me to recommend single issue 'floppy' comics, but NOT for business friends or associates. Unfortunately it is still easier to give a graphic novel that re comics in a form of a book instead of a 'comic book' itself. WEB PAGE NOTE: This blog post is written for the IE Browser standards. Netscape, Firefox and the others serve the page up differently. The screen display resolution is best seen at the setting of 1024 x 768. All images and characters within this blog post are copyright and trademark their respective owners. We also have an on-line exhibitor table at the virtual Facebook Comic Con. You can view the table by clicking this link. If you are a Facebook member, please join our Facebook Comic Con | Make It So Marketing exhibitor table for updates, specials, and other wall posts! Silver Comics For The Holidays? 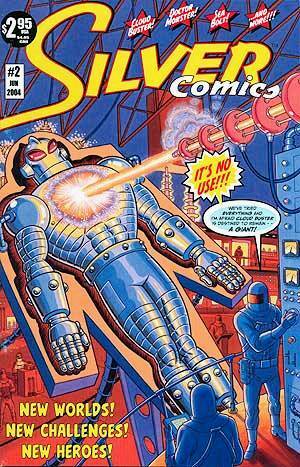 Above: The Front Cover to Issue #2 of Silver Comics! 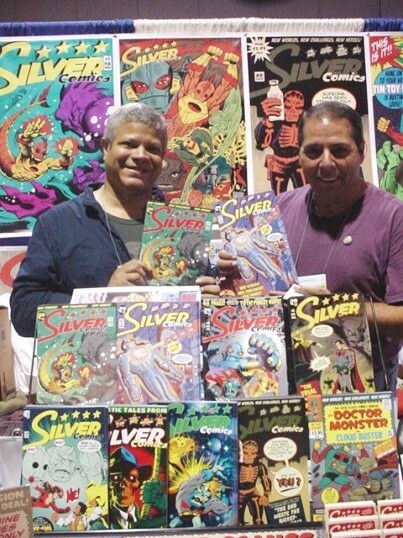 To the top right: Photo of Johnny Ortiz (l) and Vince Musacchia (r) at the 2009 LBCC! To the bottom right: Part of the Splash Page to the Seabolt story in Issue #2, as a sample to the writing and the artwork that are presented inside that story! This question was asked in between the time we held a 'Black Friday Special Event' and then our 'Cyber Monday' listings. This question is one of the HARDEST questions nowadays for me to answer, because most of the comic books being published today are definitely NOT for Kids! And yes, I do read, and possibly review those other comics and also graphic novels here in my Blog! But I do put warnings as to whom I think those comics / graphic novels are meant for. So I mentioned the above 'Silver Comics' to the potential customer, and sent them to the Silver Comics web site to purchase them from since we don't currently have them in stock. I also mentioned at the same time that I had grown up during the 'Silver Age of Comics' and really enjoyed this 9 issues series myself, and that others that grew up during that time period would more than likely also enjoy this series! 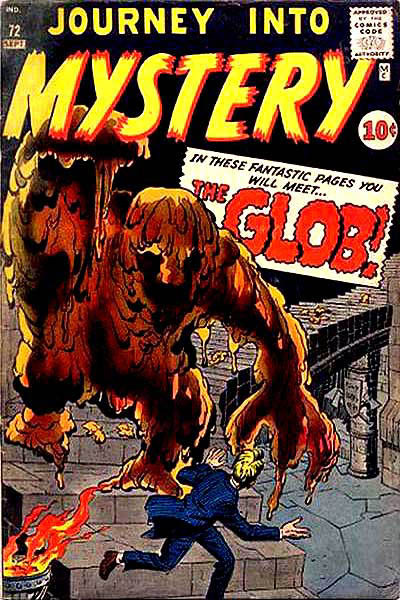 I've already blogged about issue #1 here before (click here)... and then jumped to Issue #3 that had covers by George Tuska, (who passed away recently), and Nick Cardy, (click here for that post). Cloud Buster: "The Bigger They Are -- The Harder They Fall!" Johnny Ortiz (story, penciller), Dan Beltran (writer), Alfredo Nunez (inker) Doctor Prime works with Tom (and his damaged Cloud Buster armor) in the lab. Tom remains a giant; he and the armor will not reduce back to normal size. General Holt's army attacks Ash Island. Dr. Ash transfers his mind into the body of a giant troll. Sea-Bolt: "The Attack of Dr. Dark's Brain!" 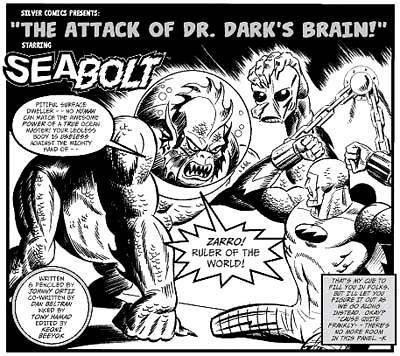 Johnny Ortiz (writer, penciller), Dan Beltran (co-writer), Tony Hamad (inker) Zarro's sub (with the captured Sea-Bolt inside) is attacked by another sub controlled by Dr. Dark's brain. An American destroyer drops a sonic charge at both subs. Sea-Bolt retrieves his helmet and tail section and fights Zarro. Both subs explode. Sea-Bolt survives, but is captured by a giant sea-serpent. Dr. Monster: "The Origin of Dr. Monster, Part 2: When Titans Crumble!" Johnny Ortiz (story, penciller), Dan Beltran (writer), Lou Rodriguez (inker) Timo watches in shock as Man-Star, under arrest for murder, is led into a transport rocket. Timo hopes that Countess Kira can help Man-Star. Kira's father, set to take control of the Council, assures her that although Man-Star has been a hero to their world, the law must be upheld. The Man Called Santa: "Jingle Hell! Jingle Hell!" Johnny Ortiz (writer, artist), Dan Beltran (co-writer) Santa fights back against Satan. Rudolph the Laser-Nosed Reindeer defeats the Martian commander Nodge. However, Satan has captured Santa's soul. Cloud Buster: This series continued to remind me of the early 1960's tales when the MoNSTer comics were evolving into Sci-Fi and then Superheroes comics. Still kept my interest! Sea Bolt: In a previous blog I mentioned that this story reminded me of the Sub-Mariner stories in the 'Tales To Astonish' title. Subby is NOT one of my favorite Marvel characters, I liked it mostly for the Adam Austin (Gene Colan) art, but this Sea Bolt storyline continued to remind me of why I liked the Subby series! Dr. Monster: The origin of Dr. Monster continues... like most 'origin stories' you kind of are waiting for the action to begin... but this origin has a good background going on. The Man Called Santa: Because of the 'cartoony' aspect of the artwork, I'm okay with still recommending this comic book title as a whole for pre-teens, even though Satan is involved in the storyline. So I've presented you with what the 2nd issue contains and my thoughts on it. Also I've provided you with links to my blog posts on the 1st and 3rd issues for my other reviews. So you can see that I do enjoy this series, and do highly recommend it for those that are looking to get others interested into comics that are NOT ready for the 'grim n gritty' comics that you find so often out there at the LCBS in your area. Plus, I truly believe that they make a great gift for someone who used to read comics during the 'Silver Age of Comics' and hasn't read a comic book in years! And you know what...? I'd even mention it to those that like the 'grim n gritty' comics of today just to expand their horizons in reading! You can find out about their latest updates plus what you can purchase from the Silver Comics folks by going to their Facebook Fan Page by clicking here! Thanks again to Johnny and Vince for taking the time to introduce me to this series when I met them at the recent Long Beach Comic Con (LBCC)! AND... Thanks again to all of YOU reading our current and archived blog posts! We do blog daily on comic book creators, comic book reviews, comic cons, and other pop culture news and events including some TV shows and theatrical films as they are shown! OTHER ILLUSTRATED ARTS FEATURETTE: This blog's 'Main Feature' today was on what items would be of interest to kids as a holiday present. Well, there are also the 'big kids' that need to be shopped for! And that is why Tina and myself have agreed to list a few prints of the Automotive Portraits in our online store from the originals that Joe Pepitone has been illustrating for his non-comics clients! For our full 'Spotlight on... Joe Pepitone' archived blog post, please click here! 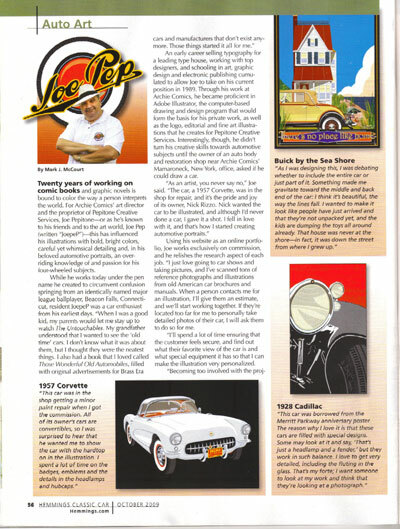 To see what prints we currently have in stock from Joe Pep, please either click the magazine article page, or click here for the prints! You truly should take a look at the prints even if you aren't in the 'market' for a print... because Joe Pep's illustrations are Awesome! 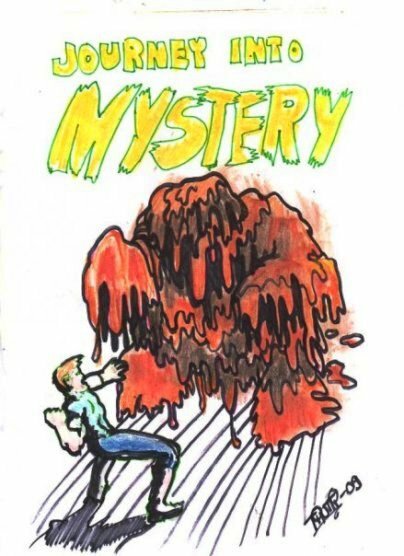 Above: The artist's sketch rendition of Journey Into Mystery #72 by Tiina Raisanen. See more of her work at Facebook Comic Con | Tiina Raisanen! 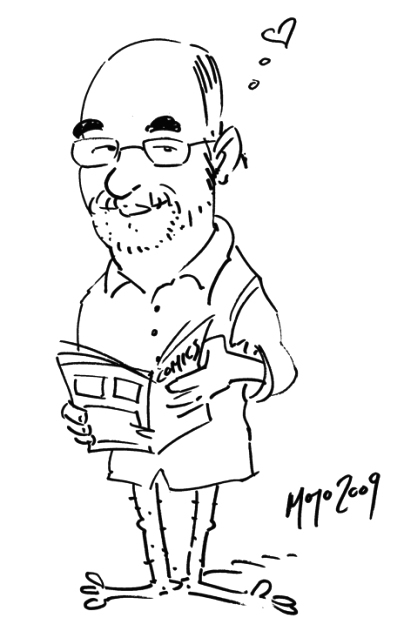 To the top right: New Facebook Friend - Magnus Olsson drew this caricature of me last night, which I thought would be perfect for a 'Cyber Monday' blog. See more of his work at his Blog! 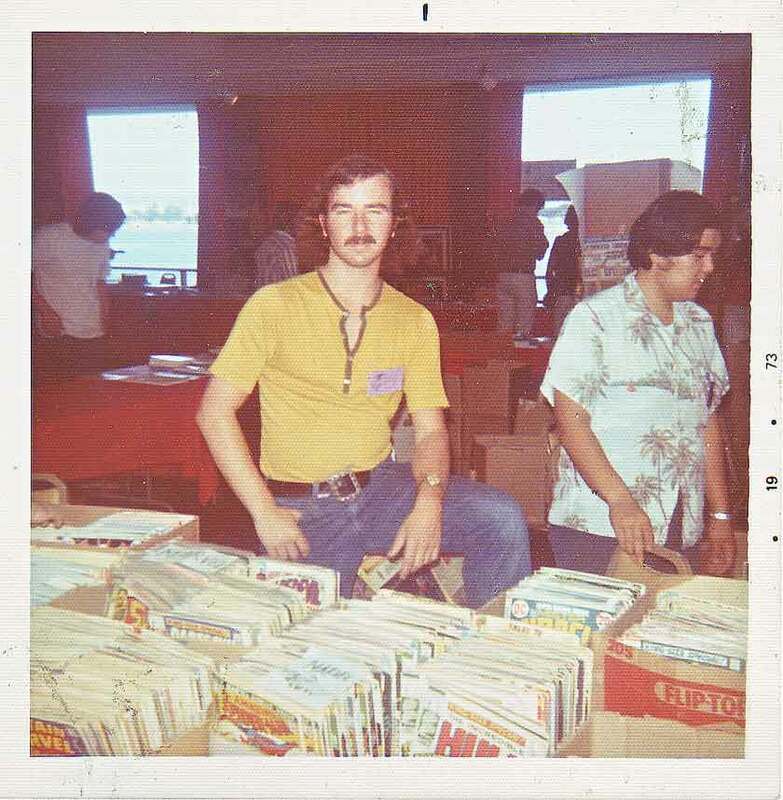 To the bottom right: Back in 1972 I set up as a comic book dealer at the 1972 San Diego Comic Con. (SDCC). That seems so long ago now, what with being able to buy comics and graphic novels via the web on 'Cyber Monday'! But please note... Comic Cons are still very popular. 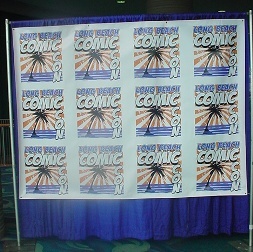 The July 2010 Comic Con International: San Diego / San Diego Comic Con (SDCC) is SOLD OUT of the Full 4 Day Memberships already! And this is only November 30th 2009! Sheesh! Facebook Comic Con is a 'virtual comic convention', so having what is traditionally seen as a 'brick n mortar' event online on a Friday may seem a little strange. However we were attempting to tie into the national event that according to CNN's Heidi Collins report that I just viewed while having breafast, had 195 million shoppers attend! The average of what each shopper spent however was $343, which was down from last year. Today's "Cyber Monday" is expected to have 100 million 'attendees' browsing on computers, especially at those attendees' places of work! Tina commented while watching the CNN report with me about who doesn't have some sort of computer at home by now? But I could see that several persons were too busy with guests over the long weekend, and otherwise occupied, so I could see several persons sneaking onto their 'work computers' to attend 'Cyber Monday'! Anyways, I'm just posting a shorter blog post this morning, so I can get back to listing comics, graphic novels, toys, etc. in our own online store at: http://www.MakeItSoMarketing.com . We had almost 6,000 listings posted as of last night, after selling quite a bit over the 'Black Friday Event / Weekend'. So we'll see what happens today on 'Cyber Monday' saleswise. Thanks again to those that joined us during our 'Black Friday Event', and for those that stopped in at our online store over the weekend! For those of you that are looking for inexpensive comics or back issues for yourself or your comics collector / reader friends, our store is always 'open' whether it's Cyber Monday or just a regular Tuesday! We do have several thousand back issues of comics starting at only $1.95 plus shipping! COMIC BOOK RESOURCES FEATURETTE: This blog's 'Main Feature' today was about the fact that "It's Cyber Monday!". 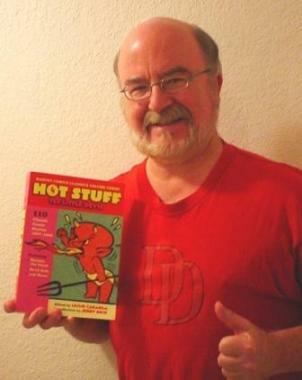 One of the reasons I blog is to write about comics history and how it pertains to me. The sketch rendition of Journey Into Mystery #72 was a 'free sketch' by the artist, Tiina Raisanen. It was a quick sketch by her during the Grand Opening of her own Facebook Comic Con exhibitor table. I enjoyed her sketch so much that she illustrated for me that I blogged about receiving back during the Grand Opening Days of her Facebook Comic Con exhibitor table. However, I'm usually not that fortunate to have a sketch readily available for me. So if I don't have a copy of the comic book I'm writing about, I usually will check out the Grand Comic Book Database, because they have almost all of the comics published with cover online for easily reference! They are also known as: http://comics.org. If you are looking for a comic book for a friend of yours that collects comics but don't know what it looks like, this database is a wonderful resource! Plus you can also find other comics there by the same creators by using their sort feature. This database has come a long way since it first started! Above is the actual front cover to the Journey Into Mystery #72 that Tiina Raisanen sketched for me. Again, my Thanks to her! Per Jamie Newbold Of Southern California Comics! 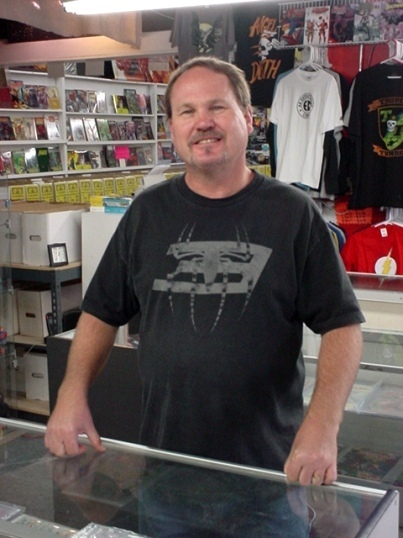 Above: The owner of Southern California Comics, Jamie Newbold. 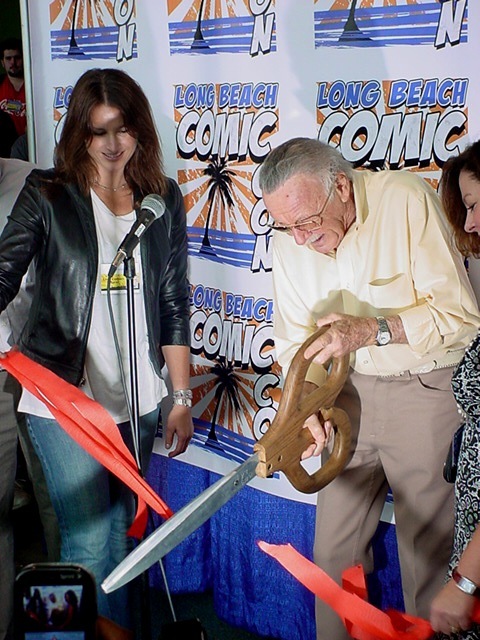 To the top right: Stan Lee cutting the Opening Day Ribbon at the exact moment during the 1st Annual Long Beach Comic Con, (LBCC). 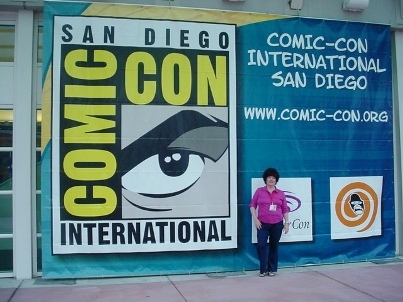 To the bottom right: Tina LoSasso standing by the large outside banner at the 2009 Comic Con International: San Diego / San Diego Comic Con (SDCC). This was her 9th straight attendance at this Comic Con! Southern California Comics, a.k.a. SoCal Comics, is owned by Jamie Newbold and is one of the major places in Metro San Diego area that I stop in at for comic book supplies and new comics for myself. When I stopped there the previous week for the FACTION comic book signing, (click here for that blog), Jamie and I went over what's been going on in San Diego sales wise for comics. 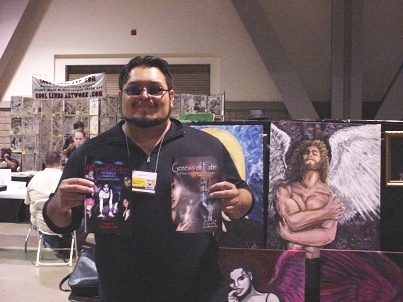 "CONVENTION SALES: On a convention level, my main show presence is at the San Diego Comic Con International. I also attend one or two other shows during the year. I gather gossip and stories from other dealers (including other Overstreet advisors). Patterns develop each year and I’m privy to the information that explains those patterns. One pattern that escaped my best prediction was the lack of sales at the 2009 San Diego Con. 2008 was a banner year for us in that the convention was just a good, easy show all the way around. However, in 2009, the show was set squarely in the second year of our country’s economic recession. In contrast to the previous show, I felt the reluctance of buyer’s spending money this year. Factors included an overcrowded dealer’s room, freebie frenzy by attendees, a lack of back-issue buyers (the common feeling was that many held off until Sunday to make their purchases) and the Hollywood distraction. I commiserated with many fellow dealers and learned it wasn’t just me who experienced low sales. No one changed seller styles or offered different products...which generally stay the same each year. The fact is that we didn’t change--the Con changed. One major difference that many have seen is that the Gold and Silver Age sellers have reduced in numbers but attendance has increased. Where and why have all the buyers gone? One dire consequence of dealer placement and large crowds are the throngs of people blocking access to one booth to get freebies or signings at another. Small press and publishers have been crammed into the same, tight area we occupy. They run promotions that generate huge lines of people and block aisles. Back issue guys don’t draw large crowds so we can’t fight back. The Con managers do little or nothing to alleviate the stress. What a zoo. The sheer volume of people at our end of the room makes access to our booths a struggle. I’d like to see the show authorities fix that. One irksome, logistical nightmare that Comic Con presents is their feedback period. Dealers with issues relating to convention problems are welcome to present them on the last day of the show. As a veteran of many Cons, I’ve gathered plenty of complaints, but I never get to air them. Why? The main reason is that the forum is held for one hour late in the afternoon on the last day when business and theft are especially heavy. When we are all busy standing in long pre-registration lines for next year’s show. When the crush to leave the dealer’s room is at its greatest I’m stuck at my booth working. In fifteen years I’ve never had a problem-free show and never been able to make it to the forum. COME ON! I give kudos to the fledgling Long Beach Comic Con. Wizard World LA left a gap when it disappeared. The Long Beach people happily filled that gap. I thought the little show had heart. Now, go see it and spend some money when it returns! Thanks again to Jamie Newbold for sharing the above with me and giving me permission to post it in my Blog! For those of you that are looking at visiting the San Diego area soon, be sure to visit Jamie's SoCal Comics store. There is much more to comics in San Diego than just the once a year Comic Con International: San Diego (CCI / SDCC) that over 125,000 people attend! Here's the direct link to Jamie's store: http://www.socalcomics.com/! COMIC CONVENTIONS FEATURETTE: This Blog's 'Main Feature' today was about 'The State of Comics Retailing in Metro San Diego Part III - Conventions'. One of the reasons that I attend as many comic cons that I do is because I want to meet creators that set up at these cons to either promote their latest creations, websites, or their sketching abilities. 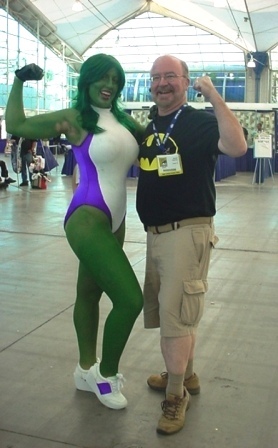 Below is Geo Brawn IV whom I met briefly at the 2009 Long Beach Comic Con. 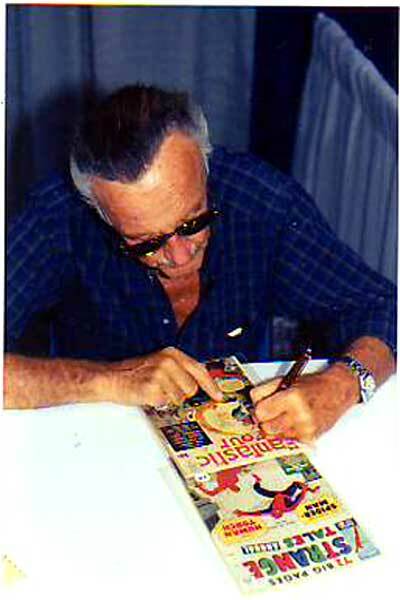 He is pictured holding a couple of his comic books, including "The Untold Chronicles: Blood Rites - Next Gen" and the "Genesis of Fate". Geo has a Fan Page at: The ART & SOUL of | Geo Brawn IV and if you are a Facebook member you can also join it and be interactive and discuss his creations with him along with other fans. Geo also has a web site at: http://www.BrawnGraphix.com for other information! Please Note: Geo's works and personal web site are intended for Mature Readers. If his genre of creations is something that you would enjoy, be sure to check out his Pricing and Commissions page! My Thanks to Geo for taking the time to show me his works! Facebook Comic Con | Make It So Marketing's Black Friday Event! A Report - The Day After! To the left: The inset photo and text for the FBCC Make It So Marketing exhibitor table as seen at: http://www.Hamersky.com, a.k.a. "Facebook Comic Con | Make It So Marketing". Above photo: A scan of the original photo from 1973, where the inset photo was taken from by Michael Netzer, Founder of the Facebook Comic Con, to write the text. 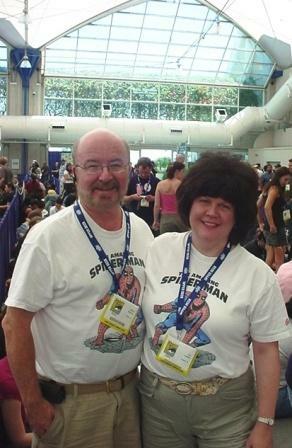 That photo is one of the couple of photos I have found going through photo albums from that period which was the 2nd San Diego Comic Con International that I sold at as a comic book dealer! I decided to set up and run this special event, on my own, after seeing no other Facebook Fan Pages or Group Pages that I belong to, doing such an event, or at least publicizing it by Tuesday evening. So, I set up the 'Event Page' first with just the preliminary data to have a 'flyer / poster' to promote. That was finished at 6:45 PM on Tuesday evening. What's an Event without prizes? So I thought since the Black Friday Event would be running from 8AM PST to 6PM PST on Friday, I should have hourly prizes. So I pulled a few comic book sets and graphic novels that I had been sent by the creators of those projects for possible review to give away as prizes. I only pulled the items that I posted favorable reviews on, as in the back of my mind I wanted to use those publications as additional promotional bonus for those creators / publishers. Then I started sending out 'invites' on Wednesday Morning, the day before Thanksgiving Day to those 'Facebook Friends' of mine at 4:45 AM. Since I was going to have to shut down operations for the day to drive up to Los Angeles at 10AM, there was only so much I could do to send out invites and continue setting up the event. So only approximately half of the 3,200 Facebook Friends that I have in my network were sent 'invites' to attend at that time. When I arrived back to my 'home office' later that day, I was able to send out a few more invites, but the final ones were sent Thursday morning, (yes... Thanksgiving Day), to the rest of the Facebook Friends. Since I was getting a late start in setting up and promoting this Black Friday Event, I wasn't able to send out email invites to non-Facebook Friends. That would have involved retrieving their email addresses and inserting into the invitation messages. In the Event text, and in the communications I was sending out, it stated that to be eligible to win a Free Prize you had to be 'attending'. What? Isn't Facebook Comic Con a 'virtual comic convention'? How could you be 'attending' an event that is in a 'virtual world'? Well... in the RSVP Box at the Event itself, there were three choices to choose from: 'Attending', 'Maybe Attending' and 'Not Attending'. In the actual emailed invites that went out to my Facebook Friends there was another choice, 'Ignore'. With over 3,200 Facebook Friends I get a LOT of invites to Fan Pages, Group Pages, Events, Causes, Game Applications, etc. And yes, I do click the 'Ignore' button on 'Causes' and 'Game Applications'... I do admit that! Additionally, since I am a comic book dealer online as well as a blogger that reviews comics, graphic novels and other publications, I don't want to possibly alienate my potential sales or reader base by joining causes! Causes that I either believe in that may not be 'popular' with some or all of my friends, group members, or readers, OR causes that I just don't want to be associated with, even though they may be 'popular' with many others but not with me. So I do click the 'Ignore' button on Causes that are sent to me to join. I also click on the 'Ignore' button for All Applications sent to me now. I used to participate in several, but found as my 'Friends' Network grew, it took longer and longer for several of the applications to work. It had to be something about pulling up the increasing numbers of Facebook Friends in the Network I've been building to make the application (app) work. Getting back to our Facebook Comic Con (FBCC) Group Page... I also want to mention that the FBCC is a network of creators and other exhibitors such as ourselves that are involved in the comics / cartooning industry. Tina and I are online comic book dealers, who also happen to have a Blog, (http://www.comicbookcollectorsblog.com/ ), that you are reading right now. The Facebook Comic Con network has over 380 'exhibitor tables' under the FBCC umbrella. 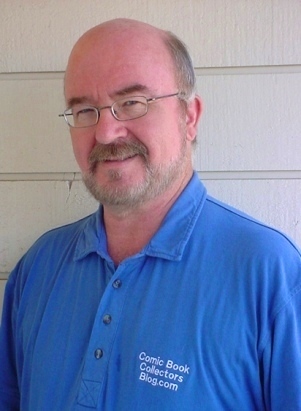 FBCC was founded earlier in 2009 by Michael Netzer. I have written a few blog posts about other sanctioned events that the FBCC has put on. An important number to remember is that according to Facebook policy, a 'Group Page' can only have 5,000 group members. You may see other pages that have up to a million 'fans'. Those pages are 'Fan Pages', which don't have a maximum set number of who can join. A 'Group Page' is limited because there are supposed to be only so many members in a 'group', and 5,000 was the chosen number of maximum membership. Okay, so I've covered FBCC itself, our FBCC - MISM exhibitor table, and the special FBCC - MISM Black Friday Event. From there I've gone into setting up the Free Prizes to be awarded, and the invitations... So What Happened Yesterday? First, sending out invites and the responses: The person(s) setting up the event can't see how many invitees actually clicked the 'Ignore' button on the actual invation. The person(s) setting up the event can see the number of 'Confirmed Guests' - those that clicked the Attending radio button. They can also see the number of 'Maybe Attending'. In my Event's case I deliberately set the 'Not Attending' persons to Not be seen by others, as those numbers would more likely be higher than those 'Attending'. I could still see those persons named as 'Not Attending' in the Event administrator's control box. The last number would be those that I would be 'Awaiting Reply'. As you can see below, that number is quite large for this event. But remember I only started setting this up on Tuesday night. Here is a link to the main Facebook Comic Con Page, which is actually defined as: FACEBOOK COMIC CON is an unofficial virtual comics, animation and media convention bringing together the robust community of industry professionals and fans registered on Facebook. So, I've covered the invites and responses participation. What about the Prizes? Yes, All ten of the prizes were awarded! And will be shipped Free of Charge by us to the winners. The full list of winners will be posted on 'The Wall' of the Event, as I have received a message this morning already asking for a full list. What I had posted was each winner's name along with the prize that was awarded after each hour. Participation is the next part of this blog's topic. For whatever reasons, there were still invitees that chose to only 'Maybe Attend', even though in the communications sent out and on the event page itself, it stated that you had to click the 'Attending' radio button to be eligible to 'win' a Free Prize. I do appreciate those that chose to 'Maybe Attend', but sorry to see that their names would not be eligible to 'win' a prize. And the Prizes were good! My thanks to those creators / publishers that sent me those publications to read and possibly review in this Blog! They made wonderful prizes, and I included a link on each photo's page to the review blog I wrote about each publication. My thoughts yesterday, and now this morning after the event as to why the participation was lower than we would have liked. Yes, the event invitations went out a little late. But usually 'Black Friday Events' are sprung on the public just a day or two in advance in the 'real world'. Secondly, it seems that the idea of 'Attending' an Event, even though it is a 'virtual event' in a 'virtual world' is a little hard to convey to the invitees. I've noticed that before at other sanctioned events at the main Facebook Comic Con. All I was asking for was for the invitee to click the 'Attending' radio button in the 'RSVP' box to be eligible to win a Free Prize! No Purchase necessary! Purchases? Yes, during this 10 hour Black Friday special event, we at http://www.MakeItSoMarketing.com were giving 'Free Shipping' to any purchases made by those with US mailing addresses during this time. Besides getting our own online store's name made more 'visible', along with our Group Page for 'Facebook Comic Con | Make It So Marketing', our intent was to also give our Facebook Friends OR our Group Page Members a chance to purchase back issues of comics, graphic novels, and other items with FREE shipping as a Bonus during that ten hour period. I have learned a lot during the past few days on setting up a Facebook Event, promoting it, running it, and communicating before, during, and now after the event itself. Those that say every business should have a 'Facebook Presence' probably have never set up and run a 'Facebook Event'! I have already set up several Fan Pages or Group Pages for others during the past year+ I have been on Facebook as a paid consultant. Trust me on this one our blog readers, setting up an Event on Facebook is 'rewarding' in more ways than one. But it is a LOT of work! Especially if You are the person that is doing the majority of the set up and running it, in the hopes of making it 'interactive' during that period of time the Event is running. I'm glad that we decided to only run our Event for the 10 hour time period... I was groggy by 6:00 PM after being up at 4:45 AM yesterday getting ready for the Event! My Thanks to all that participated in this special Event yesterday, whether by donating the prizes awarded, or by clicking the 'Attending' or 'Maybe Attending' buttons. And my Thanks for those that either publicly wrote on the Event's wall or my own personal Facebook member wall or sent me a private message! PLUS... Welcome to ALL of You that were reading the eBay Version of our Blog prior to eBay closing 'their eBay blogs platform'. That version of our Blog had 1.37 MILLION page views before the closure... However, This Blog version is the same Blog that has been published at the same time the eBay version was being published. I've been publishing this version since September 2007, so it has the same Fun Stuff You are used to on the eBay version you were reading! Speaking of eBay... Be sure to check out our new listings of comics, graphic novels, Comic Con exclusives and more pop culture items for sale in Our online eBay Featured Store that our blogs are based on! It's due to sales at this online store that keep us going with the ability to post blogs like the one you have read here today! Earlier this week I received a notice that the Pasadena Rose Bowl Flea Market is getting into the comic shows market. "A GREAT DAY OF FUN FOR THE WHOLE FAMILY" is what the Press Release stated. That's because the Rose Bowl Comic & Collectibles Show will be held in conjunction with the Rose Bowl Flea Market. RG Canning and local comic shop owner Chris Brady have joined forces to present the Rose Bowl Comic & Collectibles Show held the second Sunday of every month in conjunction with Rose Bowl Flea Market held in Pasadena. “The area has been in need of a local comic and collectibles show devoted to comics, card gaming and sports cards and memorabilia for a long time, I am proud to partnering with a great company like RG Canning to bring this project to life,” said Chris Brady, one of the promoters of the event. 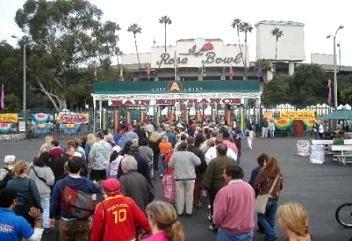 The Rose Bowl Comic & Collectibles Show kicks off on December 13, 2009 and will continue every 2nd Sunday of the month in conjunction with the Rose Bowl Flea Market held at the Rose Bowl in Pasadena California. My understanding is that this new 'Swap' show will be starting in December 2009, and then run from February thru May of 2010.